So I’m back! But I’ve got to deal with a little housekeeping before we get into the food, so please excuse me whilst I discuss something that is not at all food related and a little personal: this post has good news and bad news. The good news is that hey! I’m posting again! I know, that’s hard to believe in itself! The bad news is that I may disappear again because I am not a very well bunny & I’m going to be getting myself better & running back & forth between the doctor’s surgery, hospital & various events, so let me explain (there is food at the end of it, I promise!). If you follow me on Twitter you may have seen that I’ve been at the doctor’s & hospital a lot recently. Shortly after I returned from my amazing travels around the world, I started having dizzy spells and fainting episodes whilst out and about; I thought it might be a reaction to the rich food I’d been eating, also the fact that since I’d returned I hadn’t been eating properly, with sometimes only one meal a day, so I improved my dietary habits but the fainting didn’t stop. So ensued trip after trip to the doctor’s, culminating in a phone call from the surgery with news that I had to see the doctor urgently to discuss my results. Now don’t panic, I’m not dying (yet) and I haven’t developed diabetes (which was my first thought). It turns out that I’m not eating enough iron-rich foods and, for some bizarre reason, my thyroid gland has decided to go into overtime and make me unwell, which accounts for most of my symptoms, including the fact that I was worrying some very good friends because I couldn’t stop shaking all the time and was feeling very anxious and unhappy. After a trip to a specialist at the hospital to find out why this is happening, he provisionally diagnosed me with Grave’s Disease – a condition where your body produces too many antibodies, thus making your thyroid gland start producing too many hormones which then have nowhere to go. We’re waiting for the results to come back to confirm, but for now I’m on crazy amounts of medication, in this case for 6-8 months, after which we’ll see how I’m going, and I’m traipsing back and forth for blood tests all over the shop. So I’m here for now! But, as I’m sure you can understand, I may have to take a temporary break from blogging to allow myself to get all of my bits and bobs together. Don’t worry, I’m in very good hands – not only is Papa Lee pulling in favours left and right at the hospital, but the doctor is being very positive and my friends very wonderful and supportive… and that includes all of you! The sheer amount of messages I received through Twitter alone has completely blown my mind; thank you, all of you, I greatly appreciate the love! But this is a food blog, is it not? So, health issues aside, I feel like I should be catching up with you all, finding out how your last month or so has been going… because mine has been insanely busy. You see, these days I’m not only writing for The Arbuturian, I’m also doing actual paid recipe editing, contributing to Foodepedia and writing for the the largest local website for West London and its partners. You should see my diary, it’d make you cry – if I’m not reviewing a restaurant I’m at a meeting, if I’m not at a meeting I’m at an event, if I’m not at an event I’m product testing in my kitchen, if I’m not product testing I’m attempting to write it all up… Lord. Even I want to cry sometimes, but they’re happy tears because I’m doing exactly what I want to. So here I am, doing as much as I can in the amount of time I have in a day (there really aren’t enough hours) and I’m yours, so send me an email, drop me a comment or simply send me a Tweet and say hi. But for now, let’s talk about pie, or more importantly, blueberry pie as found at Joy of Baking. Apologies for the lack of photos so please allow me to paint a picture with my words: bestie Jun and I have been in our house for two weeks now: the walls are still a little bare but our bags are unpacked and clothes are hung neatly in closets; the leaky washing machine spins quietly in the kitchen, a hum and whirr of black and navy. Jun has been cleaning all morning, I can hear the muffled roar of the vacuum bumping the legs of her bed upstairs, whilst in the kitchen I contemplate a pint of blueberries, sun-plump and juicy. Thirty friends will be gracing our home this evening to help us “warm up” the house, and a star-studded blueberry pie, I decide, will be precisely the thing to greet our guests with; my mouth waters a little at the thought as I begin to craft my crust. I’d never made a pie before. It feels like something ridiculous difficult – precision is the name of the game when baking, after all, and it is not my forte. 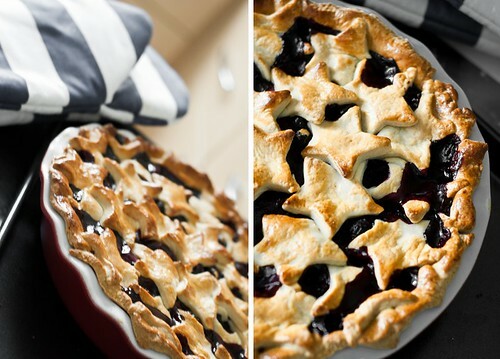 However, when I spotted this Blueberry Pie recipe at Joy of Baking I simply had to attempt it – a pie covered in stars! Stars! How much better than that could it be? Luckily for me, this pie turned out to be one of the easiest things in the world to make, if a little time consuming. It was also delicious and devoured both during the housewarming and over the following day. The sharp burst of tangy and sweet blueberries, accompanied by a golden buttery crust was the perfect combination, an ideal declaration of love for my friends and my present to you, dear friends and readers. If you’ve never made a pie before check out Joy of Baking – Stephanie’s fantastically brilliant and incredibly comprehensive site. She’s always my go to with all baked goods! 1. Make the crust: in a food processor or large bowl, place the flour, salt and sugar in the food processor and process until combined. If doing by hand, sift the ingredients together or place into the bowl and aerate with a whisk. In the food processor, add the butter and process until the mixture resembles coarse meal (about 15 seconds). If doing by hand, cut the butter into the flour with two knives until it resembles coarse meal. 2. If using a food processor, pour 1/4 cup (60 ml) of water in a slow, steady stream, through the feed tube until the dough just holds together when pinched. If necessary, add more water. Do not process more than 30 secs. If doing by hand, create a well in the center of the ingredients and gradually pour the water in, mixing in with your fingers until it has reached consistency. 3. Turn the dough onto your work surface and gather into a ball. Divide the dough in half, flattening each half into a disk, cover with plastic wrap, and refrigerate for about one hour before using. This will chill the butter and relax the gluten in the flour. 4. After the dough has chilled sufficiently, remove one portion of the dough from the fridge and place it on a lightly floured surface. Roll the pastry into a 12″ (30 cm) circle (to prevent the pastry from sticking to the counter and to ensure uniform thickness, keep lifting up and turning the pastry a quarter turn as you roll (always roll from the center of the pastry outwards)). Fold the dough in half and gently transfer to a 9″ (23 cm) pie pan. Brush off any excess flour and tuck the overhanging pastry under itself, crimping as desired. Refrigerate the pastry, covered with clingfilm, for about 30 mins before filling with the berries. 5. Meanwhile, remove the second round of pastry and roll it into a 12″ (30 cm) circle. Using a 2 1/2″ (6 cm) star cookie cutter, cut out about 20 stars. Place the stars on a parchment paper-lined baking sheet, cover with plastic wrap, and place in the refrigerator for about 30 mins. 6. Make the blueberry filling: In a small bowl mix together the sugar, corn flour, lemon juice and zest. Place the blueberries in a large bowl. Add the sugar mixture to the blueberries and gently toss to combine. Pour the mixture into the prepared pie shell. Then, in a small bowl, whisk together the egg yolk and cream. Lightly brush the rim of the pastry shell with the egg wash. Starting at the outside edge of the pie, place the cut out pastry stars in a circular pattern on top of the blueberries, making sure the tips of the stars are touching. Once the top of the pie is completely covered with the pastry stars, brush the entire surface with the egg wash, making sure that it does not pool. Place the assembled pie back in the refrigerator to chill for about 30 mins. 7. Preheat the oven to 400 degrees F (200 degrees C) and place the oven rack in the lower third of the oven. 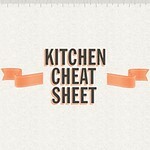 Remove the chilled pie from the fridge and place on a larger baking pan, lined with baking paper, to catch any spills. Bake the pie for about 20 mins and then reduce the oven temperature to 350 degrees F (180 degrees C). Continue to bake the pie for about 35-45 mins or until the crust is a deep golden brown color and the juices are bubbling and thick. If the edges of the pie are browning too much during baking, cover with a foil ring. 8. Place the baked pie on a wire rack to cool for several hours. Serve at room temperature with softly whipped cream or vanilla ice cream. Store any leftovers for 2-3 days at room temperature. Enjoy the pie and until next time, which hopefully won’t be too long, peace and love. Eeep! Since I haven’t been on Twitter much this past month or so I was unaware of just how bad it was getting for you. I feel like a bad friend now. =( I knew you weren’t feeling well but like you, I didn’t think it was serious. I’m glad to read you’re getting back on track and slowly working on getting better. I need my Jackie fix! Glad you are on the mend missy !! Don’t forget to leave some free time to relax in what looks like a crazy insane schedule. ! !I can imagine the stars puffs in the pie doing a merry dance in the blueberry goodness. Glad there was a reason behind the unusual health symptoms. Grave’s disease runs in my friend’s family and I actually came across several patients with Grave’s eye disease in my previous work. Take it easy and take care of yourself – there really is nothing more important than your health. Hi sweet lady :) Oh, I had no idea that this was occupying you the last several months. I’m happy to see that your spirit is strong and that things look like they are on the mend, I will be keeping your health in my thoughts and prayers. Hugs to you and be sure to make time in your busy (!) schedule for you!! What?? Oh my gosh, Jaxies, this makes me sad, because you know I love you so! So, this is treatable then, or something you’ll have to deal with for life? Jax, only you are sweet enough to have all this going on and then apologize for not having photos or posting often enough! I have no idea you are such a busy bee. Health comes first, so you must take care of yourself. Posting or not, we just want your smile and sense your laughter. :( Poor Jackie! I’m sending lots of good, trans-Atlantic thoughts your way hoping you feel better soon! Take care of yourself and don’t work too hard. Big hugs. I’ve been away from the majority of blogs and tweets for the past 3 wks due to a home internet outage. I’m sorry to hear that you have been so ill but relieved to know that a diagnosis has been made and that you are now able to receive the proper treatment. Best wishes to you for a full recovery Jackie, take good care of you. PS Your pie is beautiful! Hugs! Get better soon. The pie looks lovely. Sweet girl, I will continue to keep you in my prayers. I’m so sorry that you have been having this struggle. I had a health scare earlier this year, and it was so hard. I’m glad they figured out what is wrong, and I’m so glad you like your doctors. Please let me know if I can do ANYTHING for you. Much love from Austin. I have been a silent reader for a long time and just wanted to say that I hope your health improves and that the news from your doctor is positive. It sounds like you have a great team in your cornere, with loving friends and family you can accomplish just about anything. Good luck and good health! Hi :) I am so sorry to hear about your health concerns, but glad that your doctors have determined what is wrong and are optimistic. Keeping you in my prayers. PS: Your busy calendar sounds like a dream come true to me! I’d love to transition full time into a food writing (and eating!) career. What a blessed life you have.